For the scoop on this series of posts, click here! I decreased this recipe a bit as we only really needed to use 3 chicken breasts and I added a chopped green apple for a little interesting crunch and some fiber! I didn’t follow their recipe for poaching the chicken. Instead, I poached three chicken breasts (no skin or bone) in two cans of broth and one can of water with some carrot chunks and onion I had in the fridge. I used two cans of canellini beans, RINSED, and upped everything else accordingly for this topping. I prepped on Sunday, leaving out the rosemary, basil, and olive oil. Each night, I mixed a little of those ingredients into each portion so it tasted like I just made it. 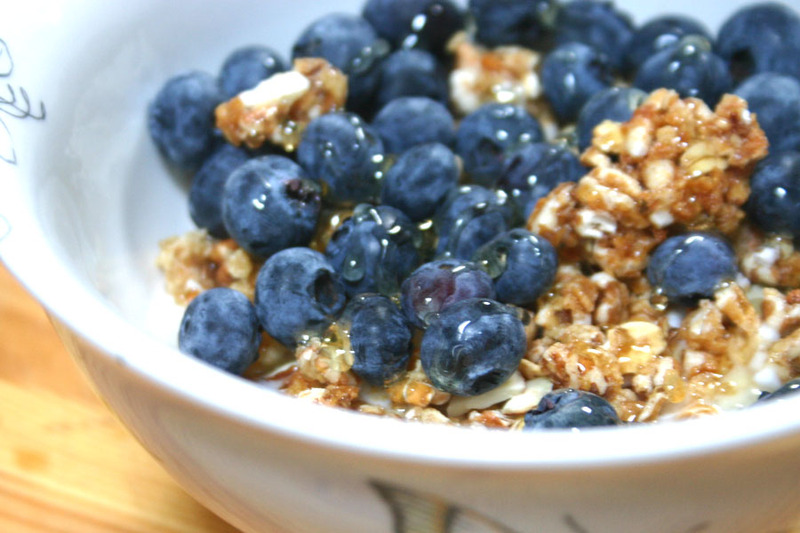 You can make this however you like, but for each person, we use about 3/4 cup of yogurt, 1/2 cup of blueberries, 1/2 cup of Kashi and a drizzle of honey. Put two heaping teaspoons of instant espresso in a tall glass. Add 1/2 cup of cold water and stir until dissolved. Add 1 cup of soy milk and stir. Top off with ice. 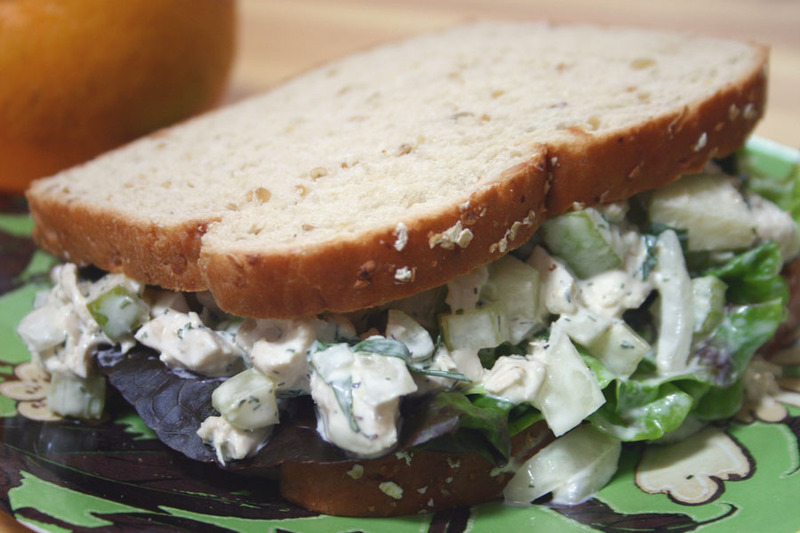 Pile lettuce and some of the chicken salad you prepped on Sunday onto bread and chow down. Don’t forget your clementine! 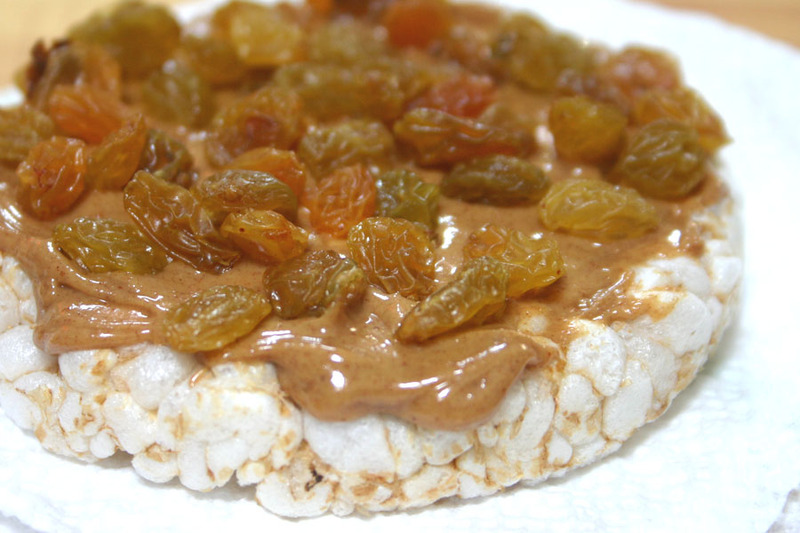 Spread some peanut butter on a rice cake and sprinkle with golden raisins. I use about 1 medium sized potato per person each night. If your red potatoes are quite small, no worries, just use more and change the list accordingly. Preheat oven to 400. Rinse potatoes and cut into 1 inch chunks. Place on a foil lined (easier to clean up) baking sheet or roasting pan. Drizzle with a little olive oil, salt and pepper and toss to coat. Roast for about 25 minutes or until tender and golden. Each night, prep your toppings while your potatoes are roasting in the oven. Mix a little rosemary, basil, and olive oil into each portion of the white bean topping you prepped on Sunday. Salt and pepper to taste. The tomato topping is better when made each night, so I use this recipe loosely. I estimated 1 chopped tomato per person, and then added everything else in the recipe to taste. Right after the potatoes are done, toast two big slices of bread per person. Cut your bread at an angle if the loaf is small. You don’t want thick toast, but you do want good surface area for your toppings! 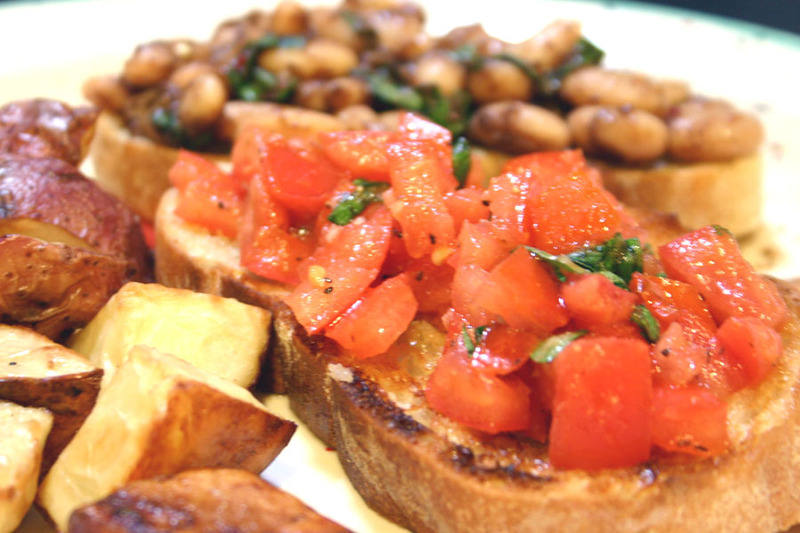 While it’s still hot, rub each side of the toasts with a garlic clove and drizzle or brush on a little olive oil. Pile on the toppings and serve with the potatoes. celery and parsley– buy some cream cheese and mix in chopped parsley. Spread onto celery sticks for a snack. olive paste or tapenade- store it in the fridge and add it (and some ricotta) to store bought pasta sauce next week. Serve over ziti. Love love love this new feature, Delia. My family can’t really eat this way for a whole week, but I love the idea and I think with some modification I could probably make it work for my lunches if not for dinner for the boys. Yay! Thanks Andrea! I hear you. It’s definitely not for everyone! 🙂 Especially if you have loved ones that need variety! But, the bigger a family gets, the easier it is to have a few different things a week with no waste or food going bad. Also, if we didn’t always eat out on the weekends, we could easily add a few more dishes to the menu to stretch through 7 days instead of 5. I love you. You amaze me. Can I just say how much I love this? This is the only time I have ever wished we did NOT have a wonderful CSA subscription. This seems so cost effective and easy and yum. Are you going to keep posting these meal plans? I would seriously consider temporarily cancelling our CSA and playing along…it would help so much with adoption costs!!! Also, I have no problem with having the same thing for all the meals! It just sounds sooo easy!